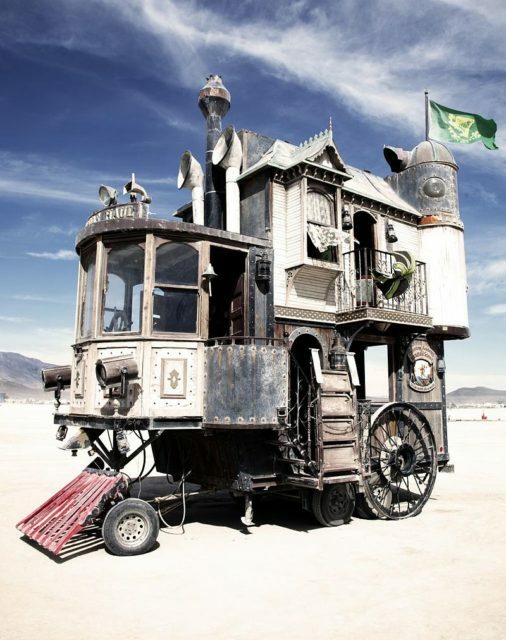 A colorful, self-propelled Victorian house was designed and built in 2006 by a team of steampunk enthusiasts. Since then, it has been traveling all over the United States, starting with the Burning Man festival. Although built just over 10 years ago, the design of the Neverwas Haul looks like it originated in another era. The late 19th century saw the rise of the genre of science fiction, which integrated Industrial Revolution inventions with concepts of the future. The design of the mobile house was inspired by the works of the famous science fiction novelists Herbert G. Wells and Jules Verne as well as Neal Stephenson’s book Snow Crash, published in 1992, which briefly mentions a mobile Victorian home on tank treads. According to the maker’s official site, the three-story home is made of 75 percent recycled materials and has a considerable assortment of curiosities collected on the numerous trips made around the globe. Among the more valued items is a camera obscura from when Jules Verne was still alive. 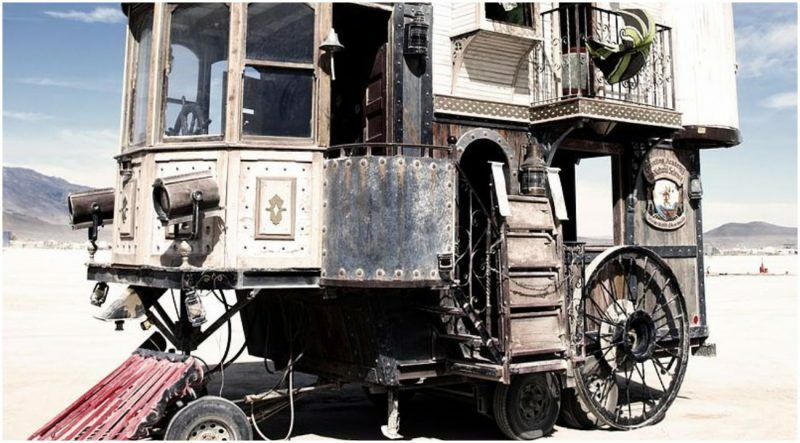 The Neverwas Haul was originally constructed for the Burning Man festival by the Academy of Unnatural Sciences of Berkley, California, and has been constantly changing since the day it was made. 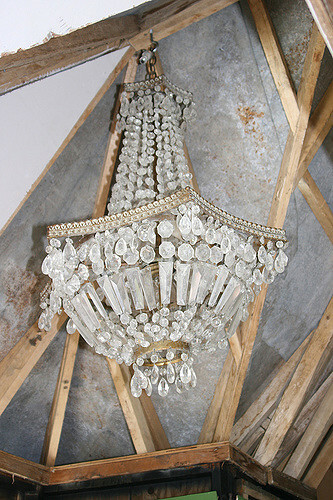 The design doesn’t really change, but worn-out pieces are constantly replaced. The Haul is made on the base of a travel trailer that is 24 feet long, 24 feet high, and 12 feet wide. Judging by its appearance, it would seem that the Haul is steam-powered, although this is not the case. The creator says that a boiler was initially installed to create steam but unfortunately it didn’t work very well. It now has a diesel engine and is maneuvered using a wooden ship’s wheel. When it is towed, the two top stories can be packed down in order for the Haul to be transported safely. When it is entirely erect, it needs 10 people to be properly and safely operated. It usually moves at a speed of about five miles per hour. 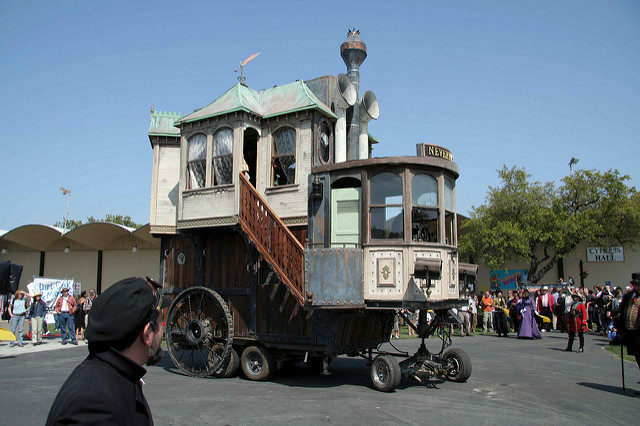 The main character behind this mixture of a vehicle and a home is a man named Shannon O’Hare, who has 25 years of experience in designing theme-park constructions all over the United States. O’Hare, also known as Major Catastrophe, was helped by 12 other people in the construction, which lasted about six months. Much like other creations of the steampunk genre, the Neverwas Haul was imagined as a part of a fictional world. The crew is all dressed appropriately when they operate the mobile house. Major Catastrophe, for example, wears a 1927 U.S. Navy officer coat. 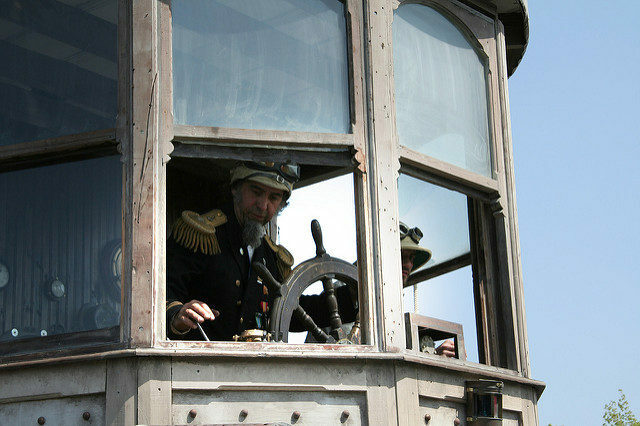 Major Catastrophe (AKA Shannon O’Hare ) at the helm of Neverwas Haul. Author: nicolas will. 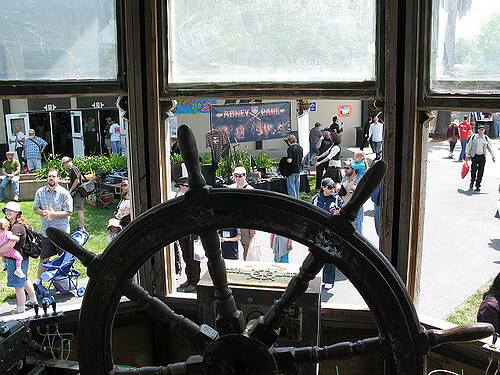 The Neverwas Haul has three main sections: the engine room, the parlour, and the command deck. If there is extra cargo, it is stored in the engine room, which can also hold six people. The controls for operating the vehicle are on the command deck. The remaining section has a bar, a library, and it holds the camera obscura. The Haul was imagined to be owned by Irish Gypsy women who would stay at home while their husbands roamed the lands to explore, fight battles, or sometimes just sell their horses to buy alcohol. The concept behind the design is that these women, in their fictional world, would build this kind of home in order to keep their families on the move. The Haul’s predecessor was a wooden Victorian clock tower built a year before the vehicle. This is when a group of people came together and began building various structures in a similar style. Before these creations, the Burning Man Festival didn’t have a steampunk section. Since then, O’Hare and his team have created several similar structures, including a steam-powered carriage named the Parlour Car or a replica of the famous San Francisco cable car. Since the appearance of this weird-looking vehicle, it has inspired other people to imagine and create their own fantastic structures.